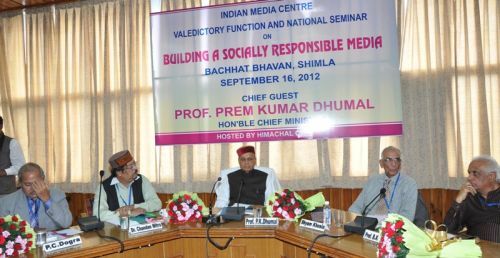 Chief Minister Prem Kumar Dhumal has stressed the need for Socially Responsible Media which would be true service to the humanity. He said that in an era of Information Technology and globalization, positivity and right approach or access to news were the hallmark of correct flow of information to the masses through various modes of media which was need of the hour. Speaking in the valedictory function of two day long National Governing Board and National Seminar on Building a Socially Responsible Media of India organised by Indian Media Centre, Himachal Chapter here today, Chief Minister said that credibility of any media is must which should not be eroded at all for the cause of the society. He said that credibility crisis is everywhere including Press and added that media should strive hard to come out of it and repose their faith in masses with factual reporting. He said that media persons were responsive towards the society and added that the problems and difficulties of the masses needed to be highlighted properly. He said that there were many challenges before the media which needed to be tackled and change these challenges into opportunity. Prof. Dhumal said that media should also lay more stress on positive journalism and policies and programmes should be highlighted in right perspective so that people could be made aware about these as well. He said that criticism if any should be healthy and not for the sake of criticism and it should be based on facts and figures so that people were not misled or misguided by vague and false dissemination of information by media. Chief Minister said that in Indian democracy, media has a responsibility which was deeply associated with the socio-economic conditions. He said that media organizations, whether in print or others have to be more accountable to the general public and added that it should be monitored that professional integrity and ethical standards were not sacrificed for sensational practices. The freedom of press in the country was a blessing for the people which could go terribly wrong when manipulations set in. He said that there was a dire need that pluralistic media organizations which were in real sense professional needed to be encouraged. Community participation is a goal that the media should strive for in a country like India, he added. Chief Minister said that media has at times successfully played the role of a watchdog of the democracy and has also aided in participatory communication, a lot still needed to be done. Print media alongwith electronic media is reshaping many of the social responses, he added. He said that radio apart from providing news and views has also developed a flair for entertainment, thereby getting a lot of acceptance. He said that there was also the new media with internet being its flag bearer. Internet has indeed made it possible to disseminate information and ideas in real time across the globe, he added. He said that media had certain obligations to society, media should be fair, objective, relevant and truthful. He said that there should be freedom of the press but there was also a need for self-regulation, it should adhere to the professional code of conduct and ethics and Government would have a role to play if under certain circumstances public interest was hampered. 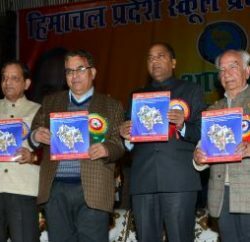 Prof. Dhumal said that the role of media in India, the largest democracy of the world was different from merely disseminating information and entertainment. Educating the masses for their social upliftment needed to be in its ambit as well, he added. He said that in a country where there was large scale poverty, unemployment and underdevelopment, media has a responsibility towards developmental journalism. It has a role to play behind formation of public opinion which can force the political parties to address the core issues haunting the country’s progress, he added. Speaking on the occasion, Dr. Chandan Mitra, Chairman of Indian Media Centre said that many new ideas and views emerged during the seminar and added that there was a need to find way out for problems and difficulties being faced by the media persons. He also stressed the need for quality reporting, training of media persons and negative reporting should be avoided so that correct message could flow among the masses. He said that journalists should also adhere to ethics of journalism and added that proper social agenda should be before the media persons and work accordingly. Shyam Khosala, Director, Indian Media Centre stressed the need for correct and factual reporting. He said that freedom of press and expression should not be curtailed and added that smooth flow of information was need of the hour. Prof. B.K. Kuthiala, Vice-Chancellor, Makhan Lal Chaturvedi University of Journalism and Communication, Bhopal, Radhe Shayam, former Editor, Dainik Tribune, N.K. Singh, former Editor, Sadhana News, P.C. Dogra, former DGP, Punjab also spoke on the occasion. Earlier, P.C. Lohumi, Chairman, Indian Media Centre, Himachal Chapter welcomed the Chief Minister and delegates for participating in the seminar. Archana Phull, General Secretary, Himachal Chapter proposed vote of thanks. 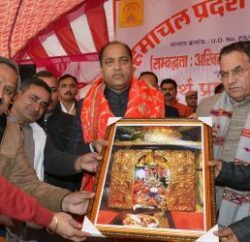 Suresh Bhardwaj, MLA, Ganesh Dutt, Vice Chairman, HIMUDA, B.D. Sharma, Director, Information and Public Relations and other senior media persons were present on the occasion among others. During the seminar resolutions were also passed unanimously. With the media facing increasing challenges, the Indian Media Centre (IMC) demanded the replacement of the Press Council of India by a Media Council, the need for a re-look at the existing sedition laws and replacement of the existing TRP system for TV describing the existing one as ‘insidious’. In its resolution on cartoonist Aseem Trivedi, it felt that the manner in which action was taken against Trivedi by the police was not warranted and that it was an abuse of sedition law but at the same time even journalists should draw a ‘Lakshman Rekha’ and in this case it was felt that the line was indeed crossed and therefore there is need for effective self regulation. IMC felt that there was need to have a wider debate on amending the existing Sedition laws which are outdated and in this regard all sections of society should be involved. 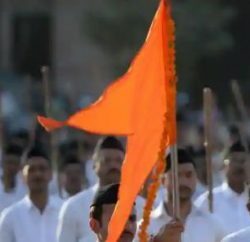 The resolution adopted at the meeting said that there is need for even media to ensure nothing anti national or degrading national symbols shold be caricatured as it involved national prestige. The Centre at its fifth meeting of the National Governing Board held in Shimla on September 15-16 opened with Chairman Chandan Mitra setting the tone for discussion with his observation on the need for IMC to step up its activities and for discussing the various issues before the media. The resolution on TRP ratings moved by Shyam Khosla too evinced keen interest among the members and it was felt that there was need to replace the existing TRP system with a more robust, transparent, representative and horizontally spread system of viewership assessment. The IMC wanted the government to hold consultation with all stakeholders including promoters of TAM and failing which the government should develop an alternative model with expenditure sharing by broadcasters, advertisers, advertising agencies and the Government. On the issuing of setting up of media council which resolution was moved Shri Krishna, the Chairman of Centre Dr. Chandan Mitra felt that the resolution could be the starting point for a wider debate to evolve a consensus on the need for having a body which would regulate the media. The resolution felt that the process of nomination to the proposed Council should be transparent and inclusive and that it should have powers to regulate media for blatantly and persistently failing to comply with its directives. Earlier, in his report, the IMC Director Shyam Khosla informed the meeting of the various activities of the Centre and felt that though membership was growing, lot more needs to be done. He felt that there was need to go beyond just holding conventions, talks and seminars and felt that the Centre should have refresher courses, workshops and studies on media related issues. Some chapters like Madhya Pradesh and Punjab have organised workshops and there was need for others to do the same. 50IMC leaders from 12 States participated at the meeting.